Today sees us start a new link up for February and I have got my Visual Journey #6 pages to show you. ... they are a beautiful shape. Scrape gesso over the pages to seal most of the surfaces. Scrape acrylic paints on the pages. Whilst damp use a stencil and rub away some of the acrylic paints. Dry. Knock it back with Dylusions white linen spray. When dry seal with a spray varnish. (mine was a shiny one). This allows you to work over the top of it without rubbing any more colour away. 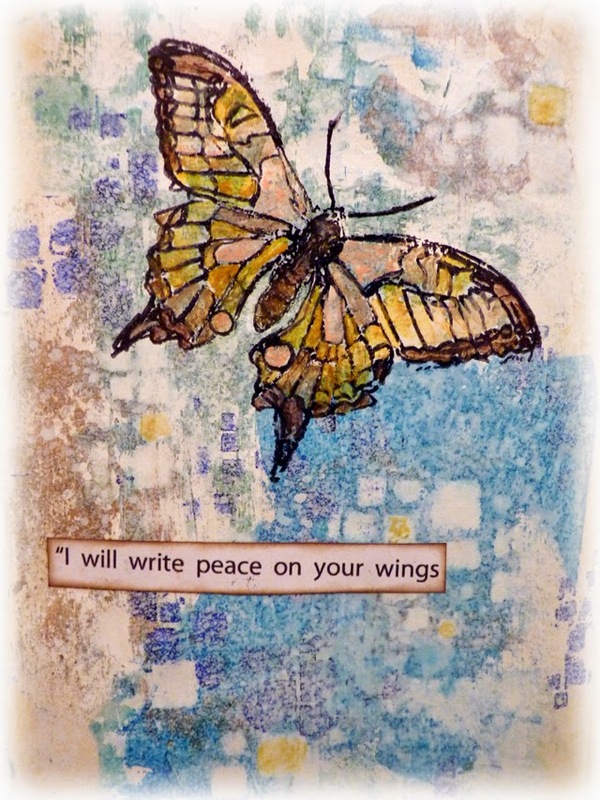 Stamp Dina Wakeley butterflies with black archival, paint with acrylics. The quote is downloaded from the internet. I am adding a new Linky for February. Thank you to everyone who shared their pages in January, it was such a pleasure to pop round to your blogs and see what you have been doing, I hope you are enjoying it too. I am now looking forward to February and seeing how your pages are developing and finding out more about how you are putting them together and what is inspiring you. Butterflies are always an inspiration for me as my Mum always used to tell me that she would return as a butterfly in her next life on earth. So I see her so often around me. Enjoy the rest of the week and thanks for stopping by. here is the Linky code for you to use. 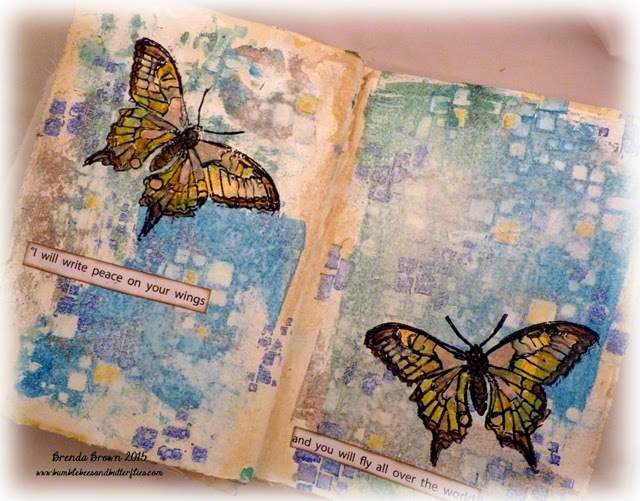 COOL pages...love the butterfly and the way you 'knocked it back' (That made me laugh!) with the Dylusions. It must be great to have a crafty sister too! 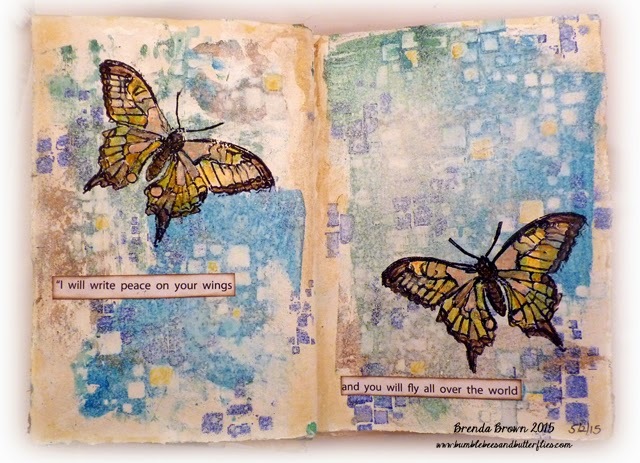 Such beautiful journal pages which ooze elegance. Brenda, this is such a wonderful remembrance of your mom....love your background and those butterflies are so real! Thanks for the reminder that Spring really isn't that far away (though it sure feels like it here!). And thanks for your visit and comments - so appreciated! Brenda, what an absolute treasure of a page! I really enjoy the process part--I learn so much! A fabulous muted background for those two lovelies! How inspiring this all is! So soft and pretty, and the colouring on the butterflies is lovely. 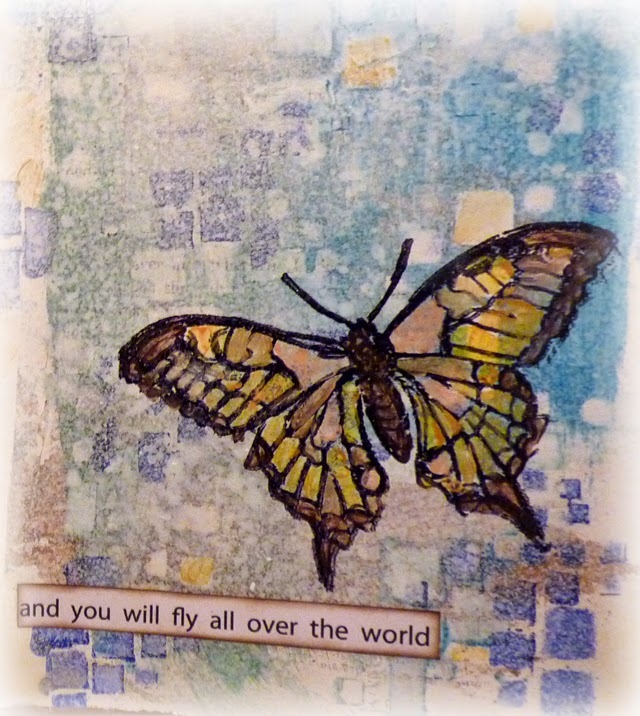 It is as though the butterflies are actually fluttering, you somehow managed to create a beautiful sense of energy on your pages and the backgrounds, they are fabulous. Sorry I have been absent from blogland. Beautiful pages, Brenda. Love the backgrounds and the feeling of movement from the b'flies.